Mulki, Mar 31, 2017 : One killed and six persons injured as private bus crashed into a truck parked on the side of the highway in Mulki on March 31, Friday evening. Elson Joy D’Souza (26), a resident of Karkala is identified as the deceased. 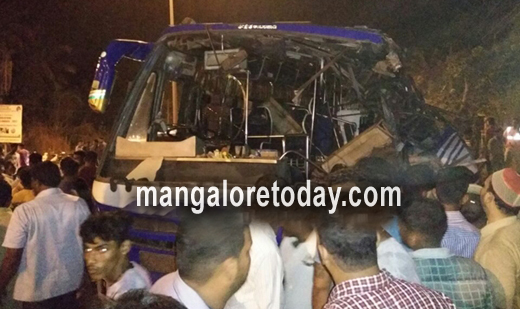 It is said that private bus plying from Mangaluru to Manipal collided with the truck parked roadside. It is suspected as the driver was unawre of the praked truck the accident occurred. Due to the impact of the collision the front portion of the bus was completey damaged . One died on the spot and six persons are seriously injured. The injured are being treated at Hospital. The identity of the injured is not ascertained yet.The traffic in the region was snarled for an hour due to the accident. Case has been registered and investigations are underway. Carelessness of the bus driver ha lead to the accident.